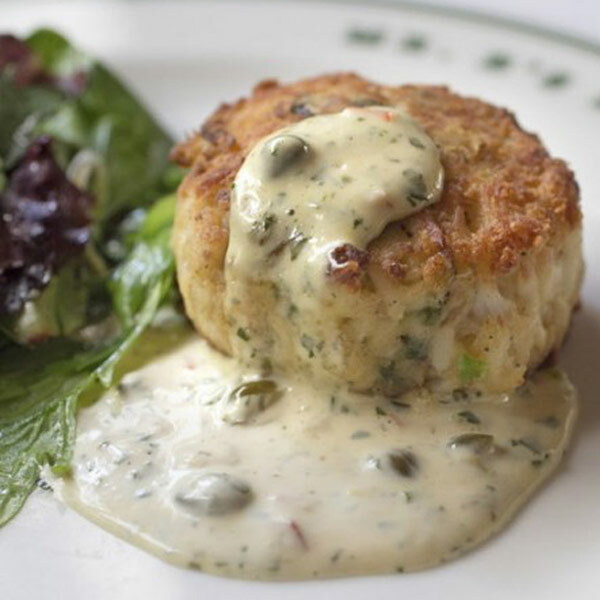 There are crabcakes, and then there are Mr. B's crabcakes. Ours are so good because they're primarily crabmeat, with a just enough breadcrumbs and mayonnaise to hold the mixture together. We serve them all day long—they're brunch under poached eggs with hollandaise, they're lunch with a salad, and they make a great starter for dinner. We recommend using Japanese breadcrumbs called panko here for their incredible lightness. You can find them in specialty food markets and Asian markets. Fine dried breadcrumbs can be used in their place, but the cakes won't be as light. In a large bowl combine crabmeat, bell peppers, mayonnaise, breadcrumbs, scallions, lemon juice, hot sauce, and Creole seasoning, being careful not to break up crabmeat lumps. Using a round cookie cutter (2 1/2 inches by 1 inch), fill cutter with mixture and form into cakes. Place on a baking sheet. Chill cakes, uncovered, 1 hour to help set. In a large skillet melt 1 tablespoon butter. Add half of cakes and cook over moderate heat until golden brown, about 1 1/2 minutes each side. Cook the remaining cakes in the same manner. Serve cakes with ravigote.